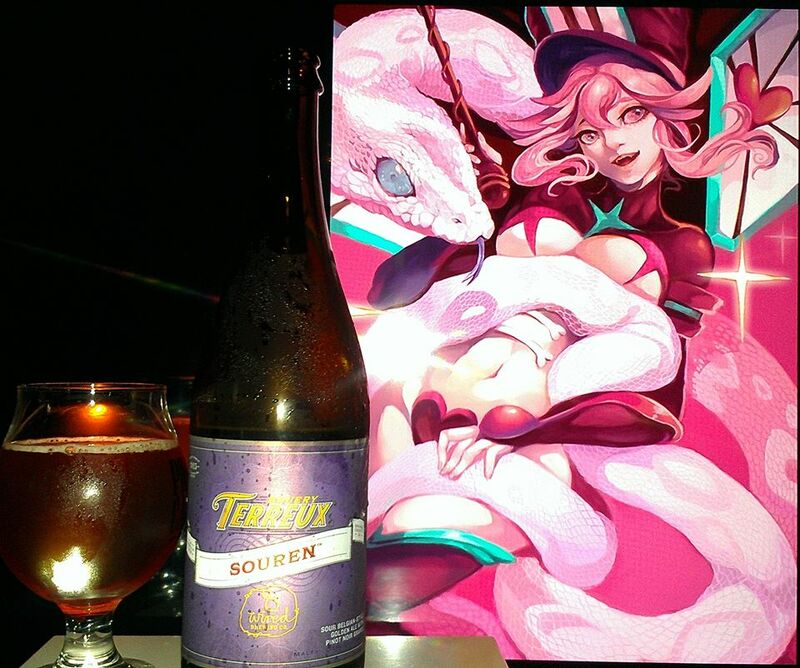 Collaboration Series: Souren, a collaboration with The Bruery Terreux and 8 Wired brewing is a 9.9% ABV Sour Belgian Golden with Pinot Noir Grapes. Souren is named for our pal Søren who runs the show down in the far-off land of New Zealand at 8 Wired Brewery. Taking the long way home after a trip to the States, Søren and his team stopped off in Placentia for a day of brewing, and we created a very California-style sour beer together. Starting with a Belgian-style golden ale base, Pinot Noir grapes were added and the beer was sent to rest in barrels at Bruery Terreux. Over the year, the complexities grew and this grapey, funky, spicy beer was born. Half Kiwi, half American, this one has a rather handsome accent. 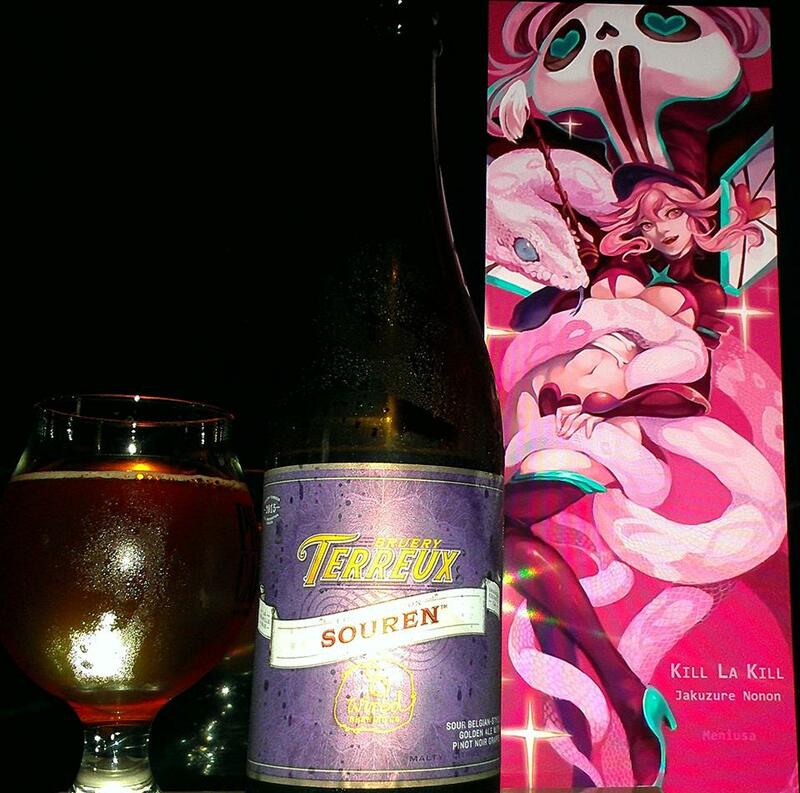 Released by the Bruery Terreux for the Reserve Society members in August 2015 after they opened their new Sour Facility. This beer is in collaboration with 8 wired which I have not tried their stuff yet but I might give them a shot now that I know of them. So this sour is supposed to cross into the realm of the wine level or so the pinot noir grapes indicate this. Sour have a special place when it comes to the wine world as some of the flavors might complimentary. It is just a thought but if not, lets just continue and give this one a shot, Cheers! Rich wine grapes, funky musty grapes, Stone fruit, apricots, peaches, apples, mango hints, strawberries, dark fruit cherries, plums, prune hints, tart berries, black berry, dragon fruit, passion fruit, Tart pineapple, oak, hibiscus flowers, lavender, peppercorns and brown sugar. Rich Concorde grapes, pinot grapes, wine grapes, white grapes, champagne, Stone fruit, apricots, apples, mango hints, strawberries, vanilla, toffee, lemon peel, orange peels, prickly pears, grapefruit peel, peppercorn, funky notes, farmhouse hay, dark fruit cherries, plums, prune hints, tart berries, black berry yogurt hints, dragon fruit, passion fruit, Tart pineapple, oak, hibiscus flowers, lavender and white sage spice. A very good sour! Seems like the Bruery has really been working to step up their sour expertise. 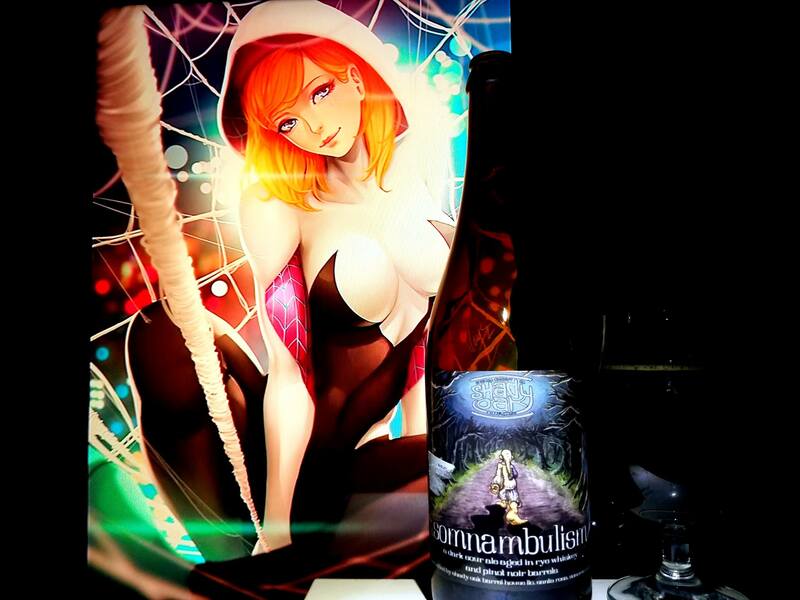 I found this pleasantly wonderful with a great balance of tart fruits and sour funkiness. I am not sure how much the 9.9% ABV helps to keep stuff in check but it seems to be working because everything is pretty balanced. For those that do not like sour, this maybe a gate way into them as you will take a liking to its sweetness and then pulled in to the sour Nirvana. Highly recommended. 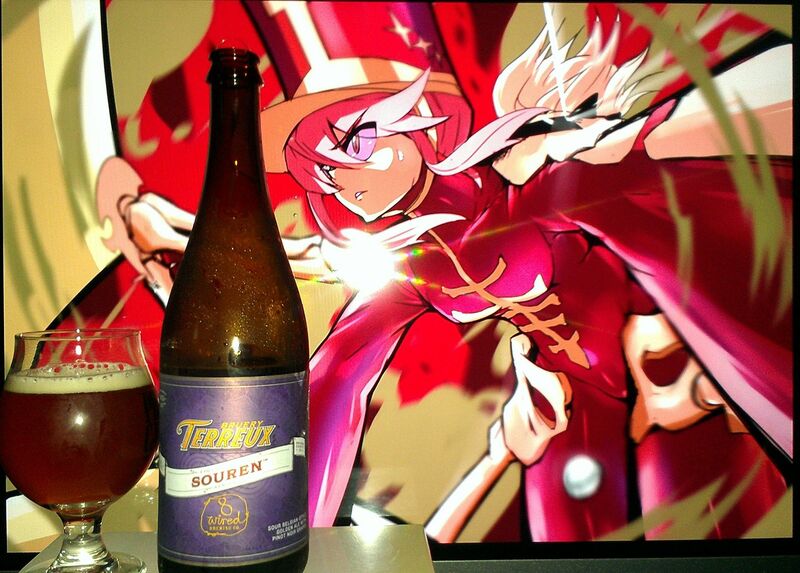 Nonon Jakuzure from Kill La Kill has made her way into her first appearance in a Bruery review. 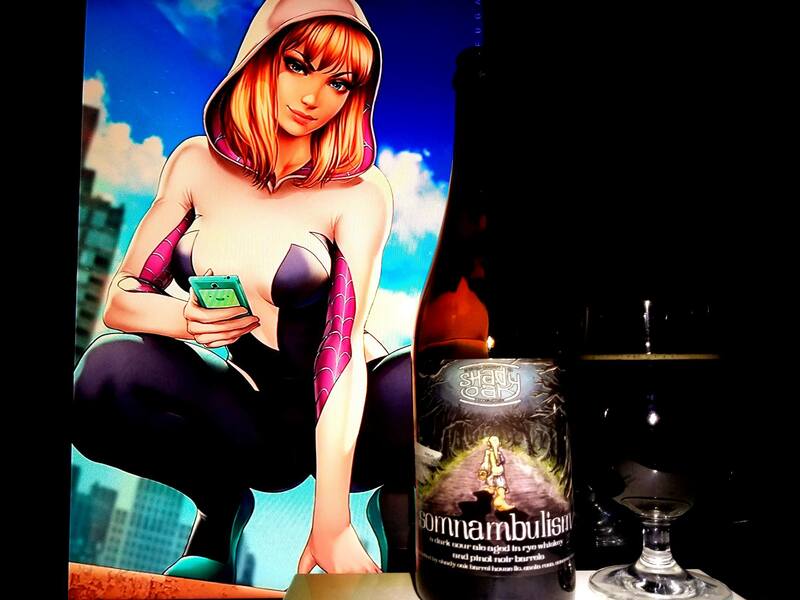 I chose her for this beer mainly due to her infamous Japanese phrase “Nani Sore!” Which you maybe able to tell it is close to the name of the beer. 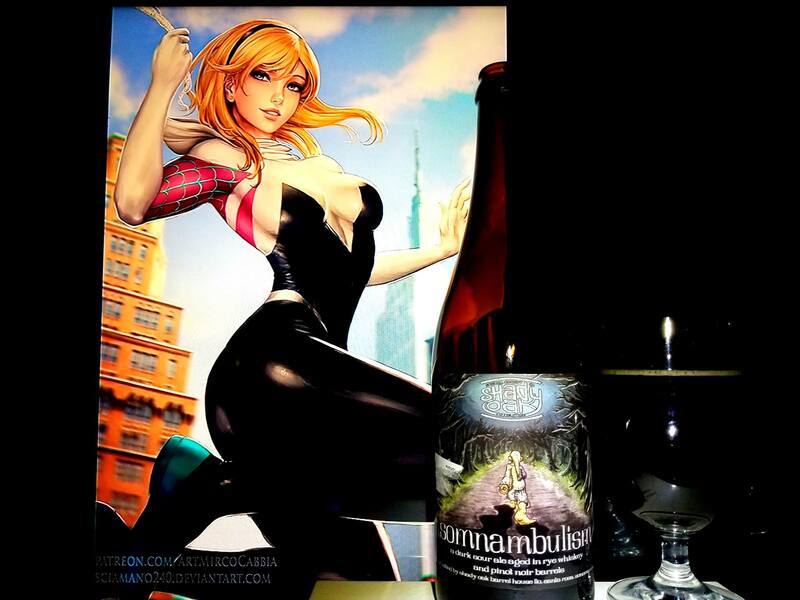 That and the fact that this beers balance is on the tart fruity and the sour funk. 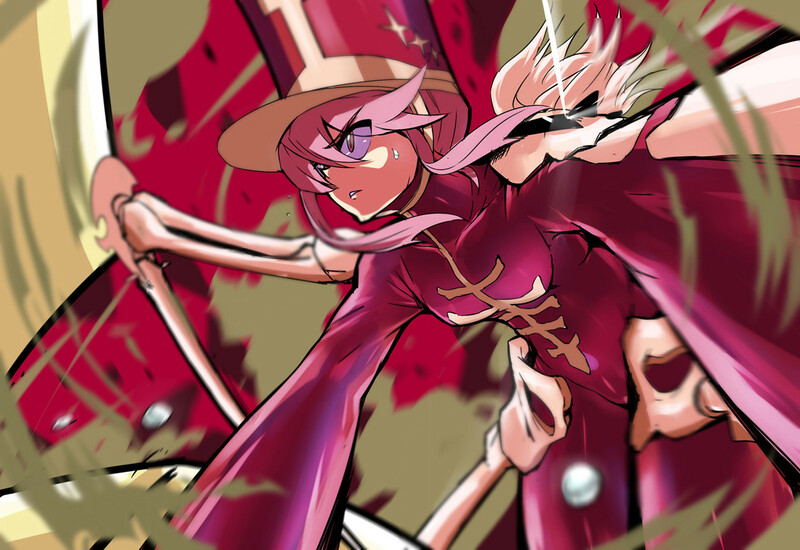 Nonon is the type of character that is sweet looking and hot on the outside like the sweet fruit flavors of the beer but damn, she can be rude, obnoxious and in some for rotten to the core which coincide with the sour funkiness. However, it is not to say she is a bad girl by any means as she is a supporting character to the protagonist’s sister (Ryuko’s sister Satsuki). 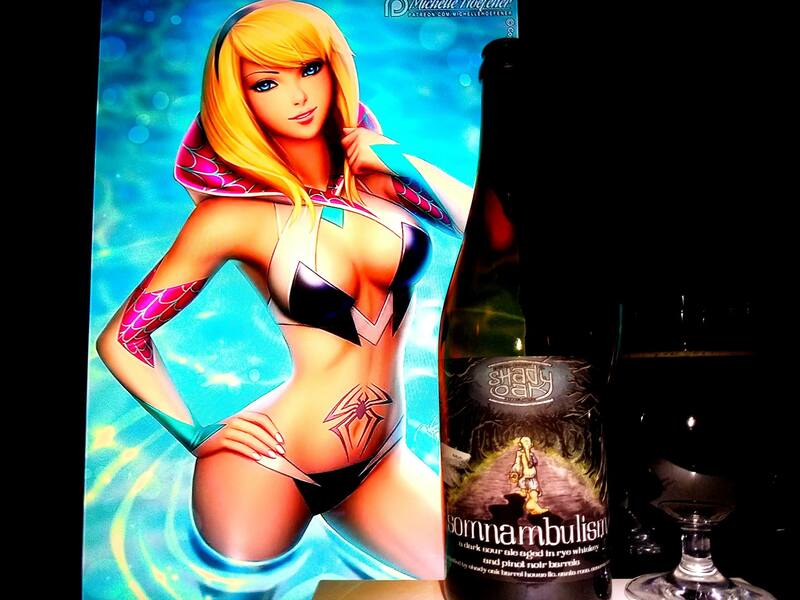 So because the beer so delicious and balanced, she works out for this beer. Not to mention, her pink colors contrast that of the rich berries and grapes. 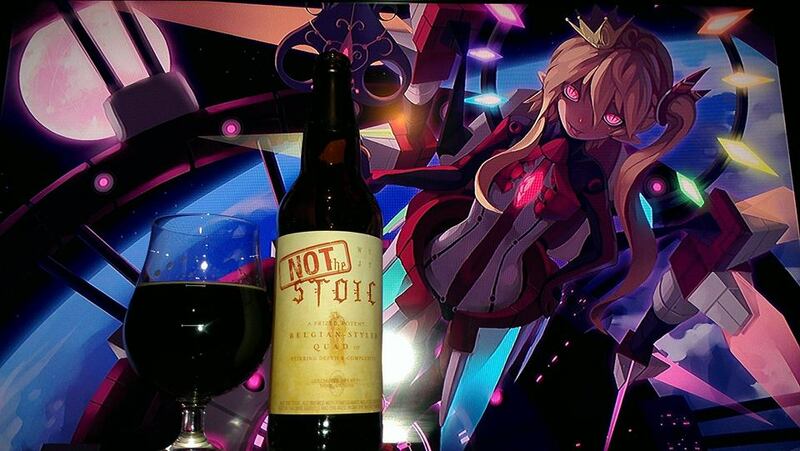 NOT the Stoic by Deschutes brewing is a 12% Belgian Quad brewed with pomegranate molasses and aged 11 months in 15% Pinot Noir oak wine barrels and 15% Rye Whiskey Barrels. A prized, Potent, Belgian-Styled Quad of Stirring depth & complexity. A Virtuous return. Aged and sequestered in select oak casks. The result – A contemplatively brewed quad, created in homage to all those who doubted the original. This unrepentant rendition is definitely, NOT THE STOIC. Been waiting for this sucker for a very long time. I have never tried the original as I have never been lucky enough to find it before they stopped making it. With this release, I was not gonna miss this one up. Quadruples and Dark Belgian beers are some of my favorites and it really takes a lot to make a really bad quad, well, bad. This is highly coveted for its rarity and increasing popularity, although very limited. Get this one if you can. Lots of dark fruits like dark cherries, figs, plums, cranberries, pomegranates, oak, port wine, dulce de leche caramel, vanilla, marshmallows, smores, flan, pecan pie, hazelnut, walnuts, bananas, clove spice, burnt sugar, brown sugar, maple syrup, molasses, chocolate notes, rye, lots of wine grapes, coconut hints, peaches and cream, apricots and apples. Rich Dark cherries, dark fruits, raisins, plums, figs, currants, pomegranate, cranberry, wine grapes, oak, leather, port wine, rye bread, rye whiskey, coconut, dulce de leche caramel, burnt sugar, vanilla, maple syrup, molasses, flan, brown sugar, chocolate notes, hazelnut, pecan pie, walnut cream, bananas, clove spice, oak, peaches, apricots, apples, marshmallows, smores, molasses and cinnamon. Lingering maple, wine grapes, pecan pie, caramel, vanilla, oak, dark fruits and molasses linger. A silky mouthfeel with no alcohol in the taste, a sipping beer still even it is pretty damn smooth. One of the 5th strongest ABV quads I have ever had, Strongest being the Forgotten Island Quad (15%) and maybe Sede Vacante to some extent. A quad definitely exceeding a lot of my expectations! The blend of the whiskey barrel and wine oak barrels reminding me of what would happen scenario if we took St. Bernardus and Trois Pistoles and we aged them in Wine and Whiskey Barrels. That beer would be even crazier but for now, the possibility of such a thing is highly exemplified in NOT the Stoic. This is not your typical quadruple that is damn sure. I highly recommended!! 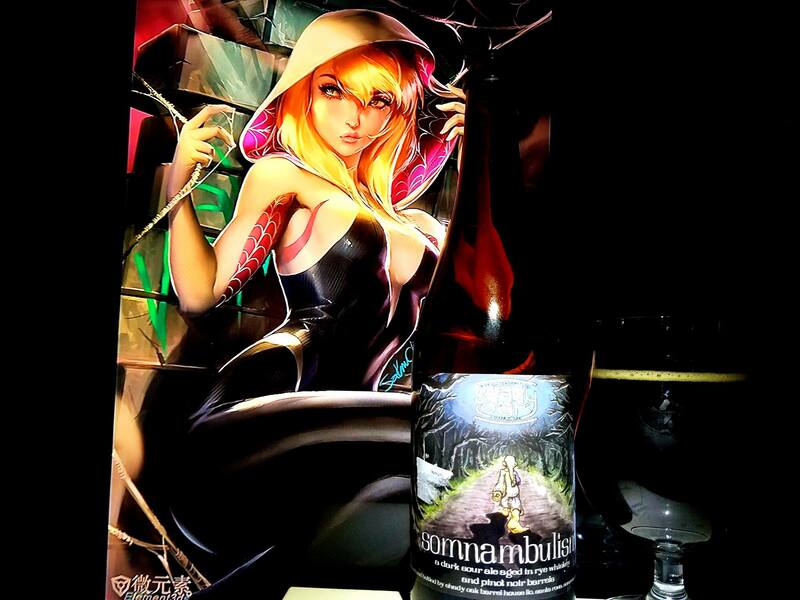 Flandre Scarlet from the Touhou series was used in this pairing to exemplify the craziness of the character as it relates to the beer. For fans of the character, yes, I do mean with the whole U.N. Owen was Her Name which is her theme in that crazy game. This beer is no longer the stoic. It has been tainted, corrupted and demented in darkness and complexity that it will never be the same. This is not necessarily a bad thing. It’s increase in complexity with its increase in ABV make it very dangerous as this drinks rather easily. That is the dangerous part. 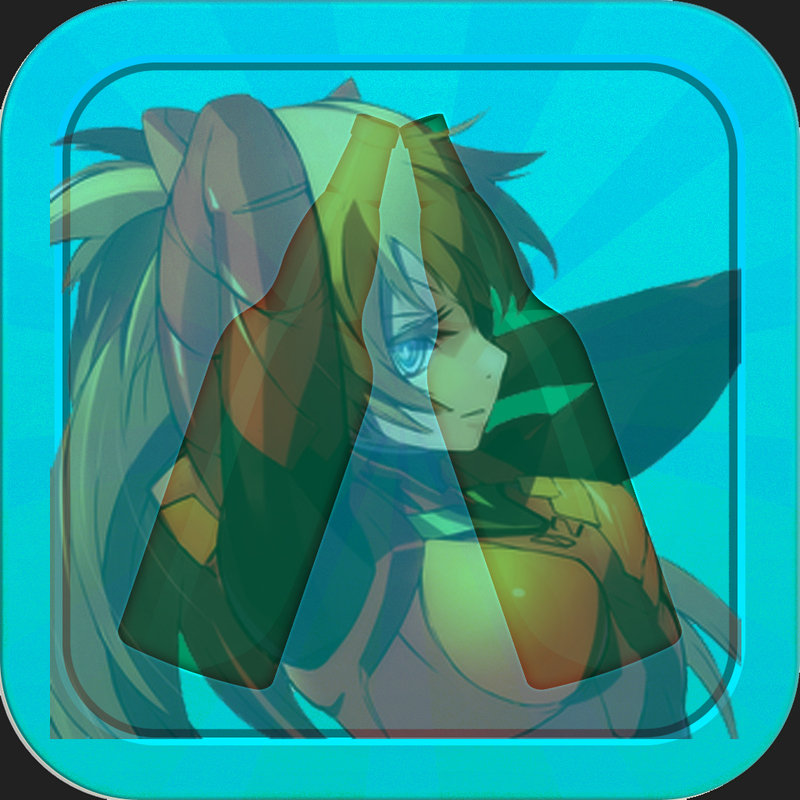 Just like Flandre Scarlet. Enjoy at your own damn risk, cuz trust me, you won’t want to finish her in one sitting! 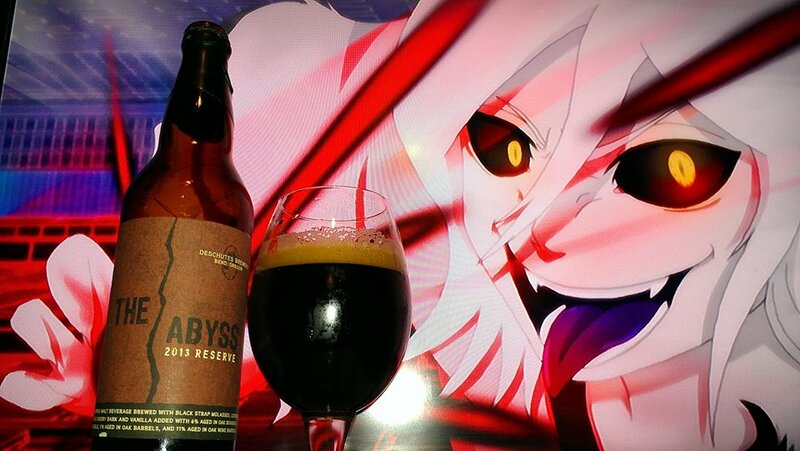 The Abyss 2013 Release by Deschutes Brewing is an 11% World Class Imperial Stout brewed with Black Strap molasses, Licorice with cherry bark and vanilla added with 6% aged in oak bourbon barrel, 11% aged in Oregon Oak Barrels, and 11% aged in oak Pinot Noir wine barrels. It’s dark. It’s deep. It’s mysterious. Aged in French Oak and Bourbon barrels, this special brew has immeasurable depth inviting you to explore and discover its rich, complex profile. The flavor of molasses and licorice draw you in further and further with each sip. The Abyss beckons. Enjoy the journey. 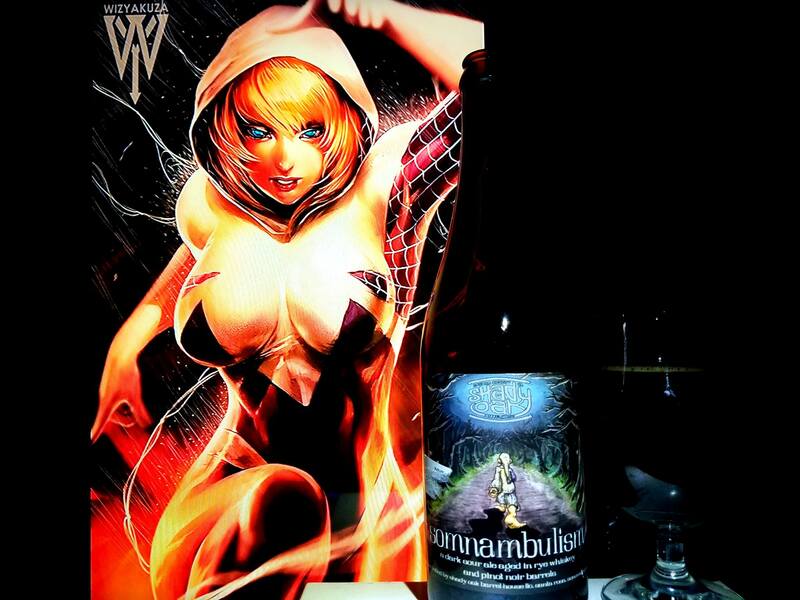 I have previously reviews the 2009 version of this beer. I decided to give it another round as I may not often get around to reviewing this one again. Upon looking at this one, I saw it was made a bit differently than the 2009 version. I had to give it a shot. 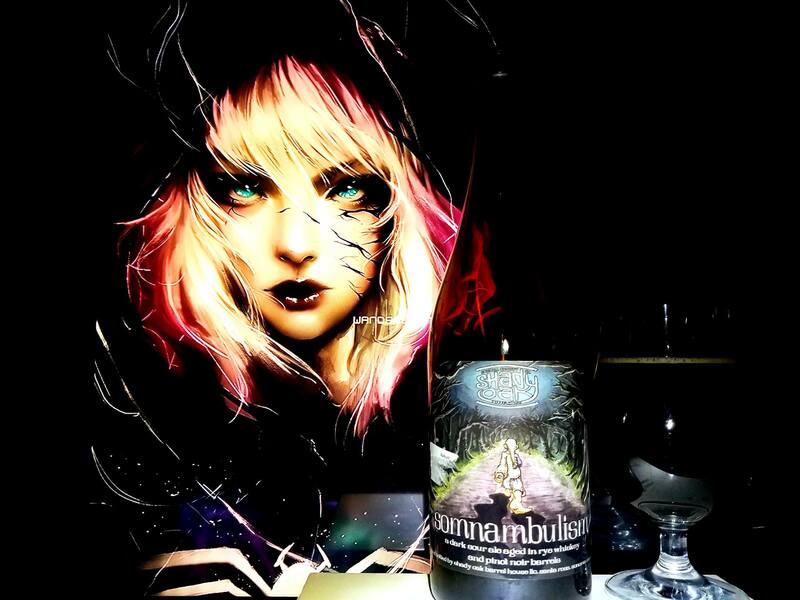 Madrugada Obscura, basically sour stout notes, wine notes, roasted coffee, dark and milk chocolate, smokey oak, dark fruits, coconut, cherry notes, flan notes, espresso, molasses, licorice, clove spice, cinnamon and other complex notes. 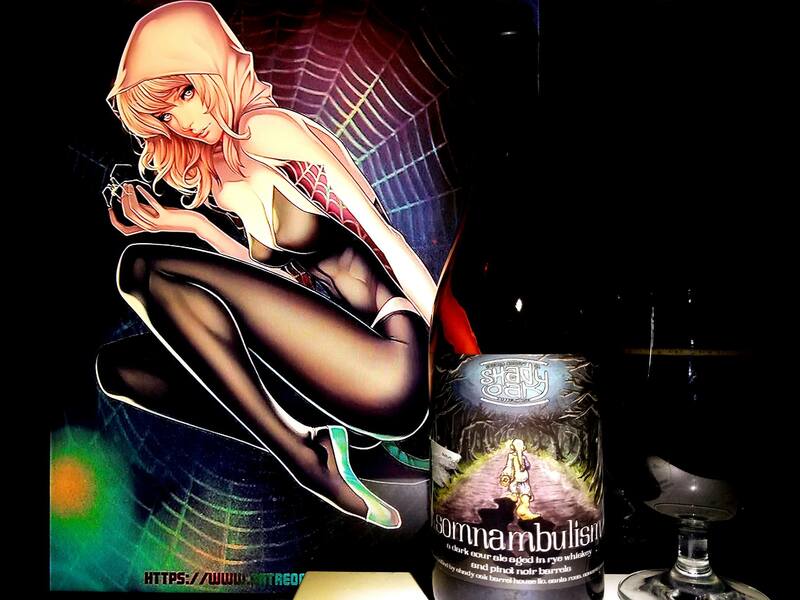 Wine, Bourbon, Stout, Marugada Obscura, milk chocolate, dark chocolate, cherries, dark fruits, raisins, figs, smokey quality, Port wine, vanilla, caramel, oak, roasted chocolate, coconut, flan, licorice, molasses, pinot noir and earthy hops. After letting it warm up it started to evolve in flavors again. Funny as the 2009 version evolved too. Now this thing is tasting a bit like banana notes, crème brulee, raisin bread pudding, overall bitter roasted coffee, Kahlua, mocha, barley wine caramel, toffee, butterscotch, almonds, pecan pie, cherry, plums, hazelnut and well, it seems to keep going. I will stop right here. Finishes off very complex with the dark chocolate, dark fruit, dark oak, dark bourbon, dark flan, dark dark dark!! Good Luck finding the 11% ABV in the taste. She is pretty deadly seeing as it is asipping beer but with chances are you want to drink and drink. Evil!! 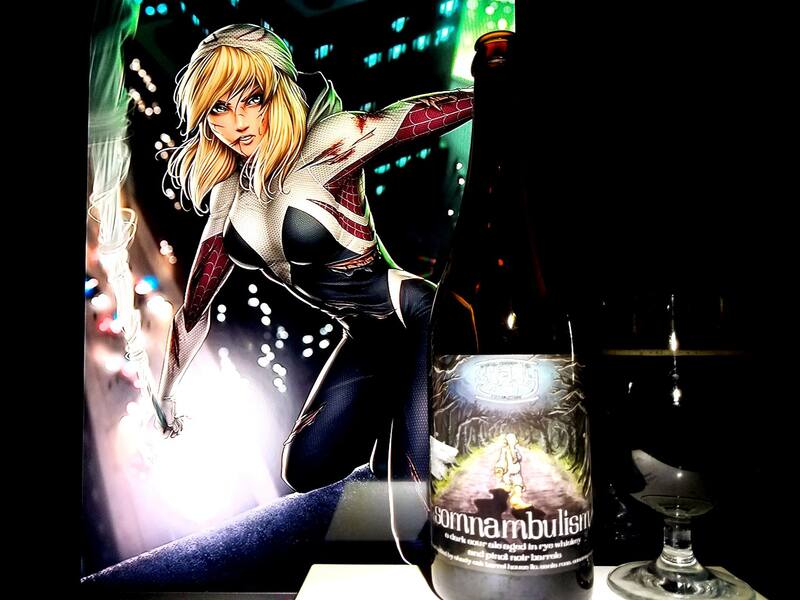 Rukia Kuchiki (Hollified version) from Bleach was used in this pairing to show several things I had in mind when pairing this beer. In the series, the hollow form is what happens when after a soul passes and loses its tie to the body. If the soul reaper does not cleanse the soul, it will roam the earthy, become a monster and try to eat other souls. Rukia is a Soul reaper in the show but there are many characters such as humans and even soul reapers that have treaded into the hollow form and were able to come back to their original form. Rukia never becomes hollow but this only serves as a representation of what that form would look like. Most hollows are mindless and possibly evil. In some cases, she can be seen as sadistic with no remorse or pity for anyone. Aim for the kill, hunger for more flavors. 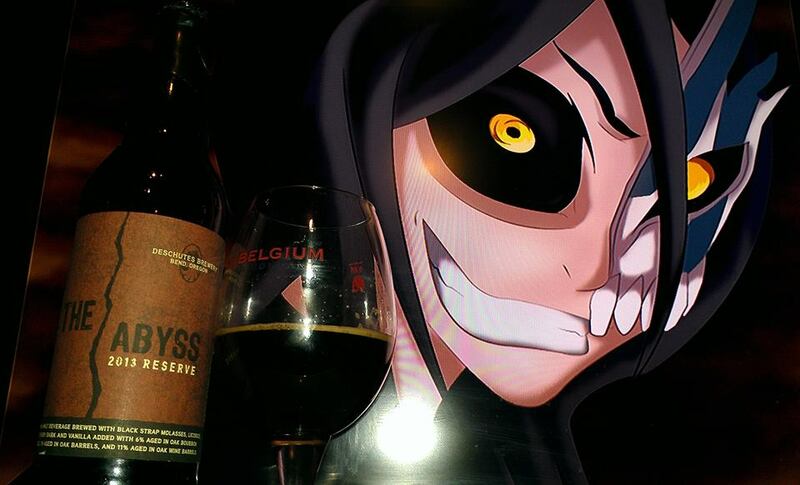 Thus, this evil version of Rukia is paired with this beer to show how evil the beer is. That is why you have to be careful not to drink it all in one sitting. Since the hollow form is a form of evolution into possibly higher form of power, you can say the evolution of flavors as the beer warms up and the alcohol content represents this hollow form. Also, the Cero Blast that Rukia is charging up in her hand represents, The Abyss. The Cero is like an endless charge of energy concentrated and sucked up like a black hole. 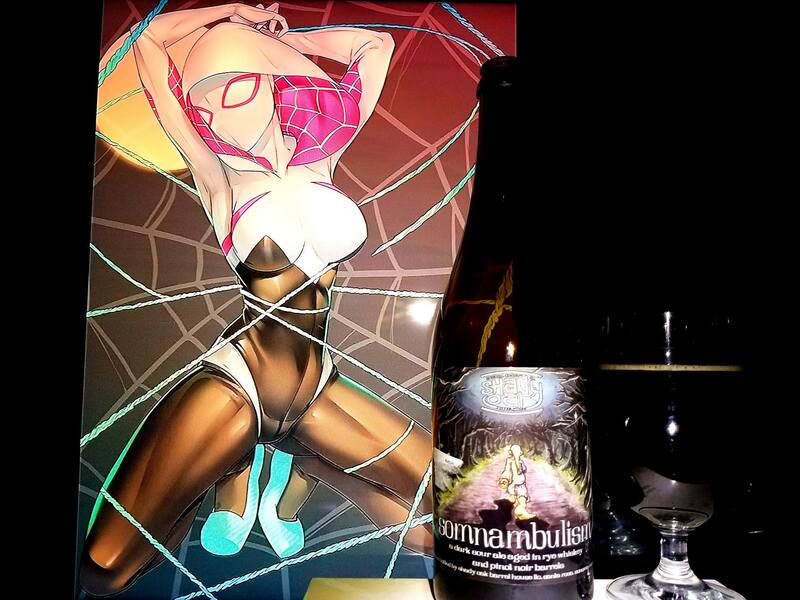 This infinite darkness is this beer, The Abyss. Ale brewed with Summit hops. First with a Belgian yeast second in Pinot Noir and rye whisky barrels. And Finally in the bottle with a wine yeast for natural carbonation. The hour of darkness is one of slumber for most. There are those, however, that do their best diabolical work when left to their own devices in the dark underworld. These creatures toil silently and mysteriously, transforming their subjects into an alluring liquid that, by the light of day is as dark as the night, but with truly enlightening qualities when beholden by those in search of good things. Such is the case with the mighty Saccharomyces as it converts the complex sugars of Anchorage Brewing Company’s The Darkest Hour, into brooding, almost dangerous Belgian Style Imperial Stout, borne of complex malts, subtle, but distinctive hops and a stern command from the master’s hand that all things that come to life must be good. 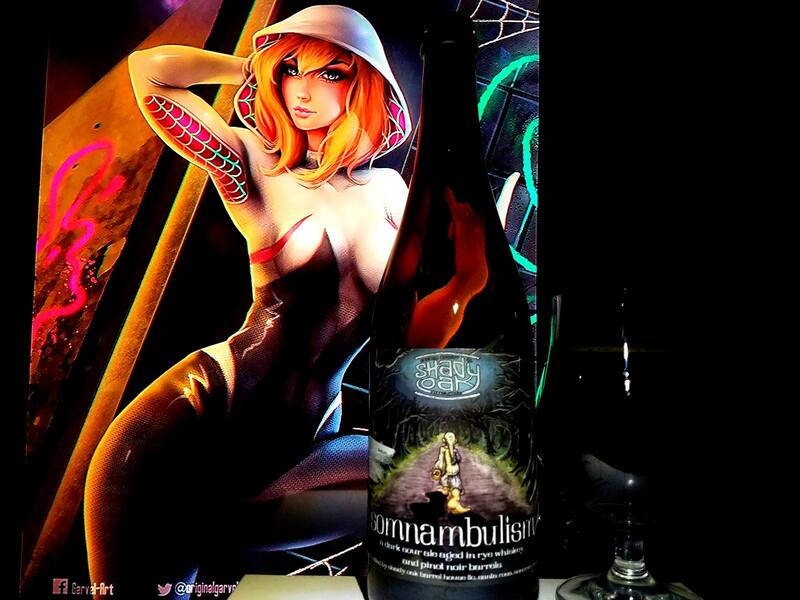 From the dark depths of the oak awakes this mighty brew that at 13 percent alcohol gives pause to the mortals of lesser fortitude. 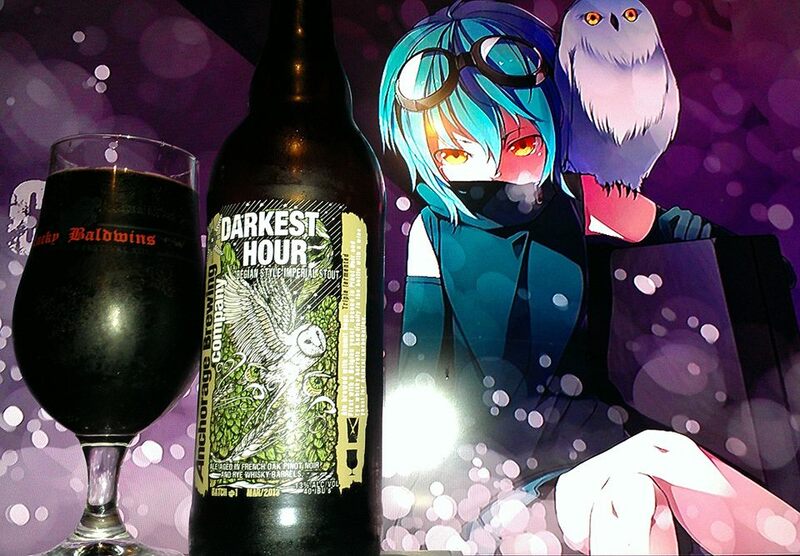 Sip deeply, but imbibe slowly, lest you succumb to the dark powers of this melancholy brew with deep, rich flavors. Drink in the darkness if you must, but edge closer to the fire if one’s kindled nearby. 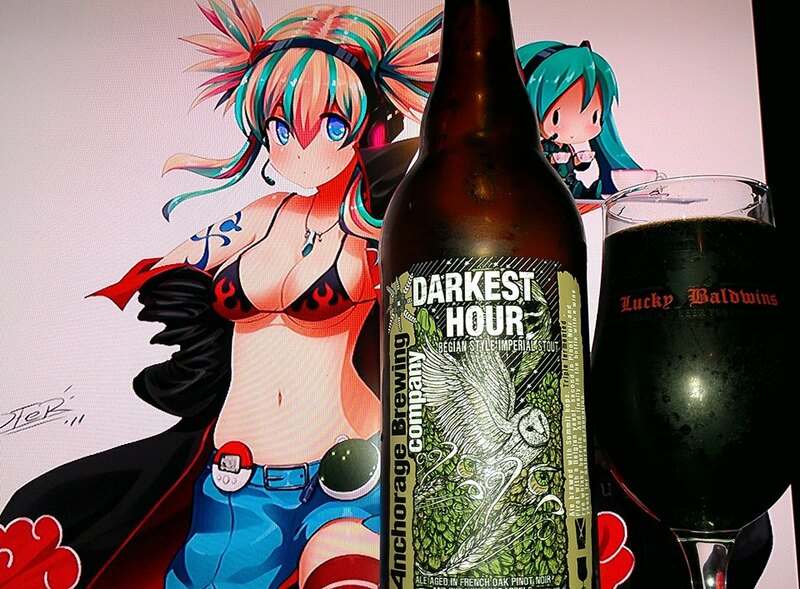 The Darkest Hour will fill your palate and your mind with things you may not have considered before. 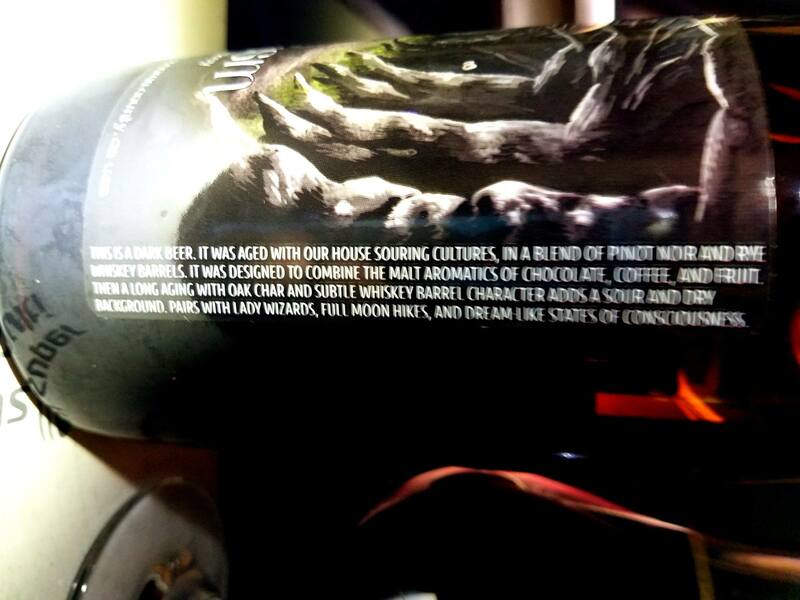 At Anchorage Brewing Company, we bid you good thoughts with the help of our newest creation. Been waiting a while for this release. It is not often that a rich Belgian chocolate desert such as the Belgian Imperial Stout is brewed. Being one of my favorite hidden styles is something I sure as hell do not pass up. Some examples of the style is the Buffalo Stout, Allagash Black, Stillwater Artisanal Folklore, Great Divide Belgian Yeti, Stone Belgo Anise RIS, Ommegang Chocolate Indulgence, Maui Aloha B’ak’tun, Elysian Omen, Ommegang Art of Darkness, The Lost Abbey Deliverance, Samuel Adams Thirteenth Hour Stout and to some extent, Trois Pistoles and Black Tuesday/Grey Monday/Chocolate Rain/Melange 3. Aromas star off very similar to Black Tuesday but dwell in the in the Trois Pistoles zone. There is whiff of a lot of chocolate followed by grape wine, Bourbon, vanilla, Dulce de leche chocolate, raisins, flan, toffee, dark cherries, plums, oak, molasses, anise, coconut, black currants, raisin bread pudding, hazelnut, pecan pie, musty grapes and dates. The flavors are a lot like a wine. In fact, the beer seems closer to a wine to some degree. Like a sweet chocolate wine booziness. However, it also reminds me a lot of The Lost Abbey Deliverance. This is really cool as Deliverance only comes in a 330ml bottle. Quite the difference :D. You can still tell this is a Belgian Stout though. It has flavors of dark chocolate, milk chocolate, wine grapes, raisins, toffee, dulce de leche caramel, walnuts and pecan pie, flan, whisky, vanilla, currants, cherries, coconut, oak, slight smokiness, raisin bread pudding, light mocha, molasses and slight anise. The after taste leaves with like a dry walnut and grape chocolate taste. Pretty fancy stuff but not to the flavors of Black Tuesday. It smells awesome but if you don’t like wine, it may not be for you. I don’t mind this at all. It really is a different type of style. It is almost as if Trois Pistoles added more chocolate and leaned more toward the Pinot Noir than the Port Wine instead. Definitely worth the pickup. I enjoyed this one a lot.